Projectors aren’t just a blast from the past. Many of us probably remember them from school, where teachers would place important information on them for the whole class to see, or even your homework in some cases. However, they are so much more than they seem, and are actually coming back into fashion after being seen as boring for so long. We highly recommend you jump on the bandwagon and see what projectors have to offer. 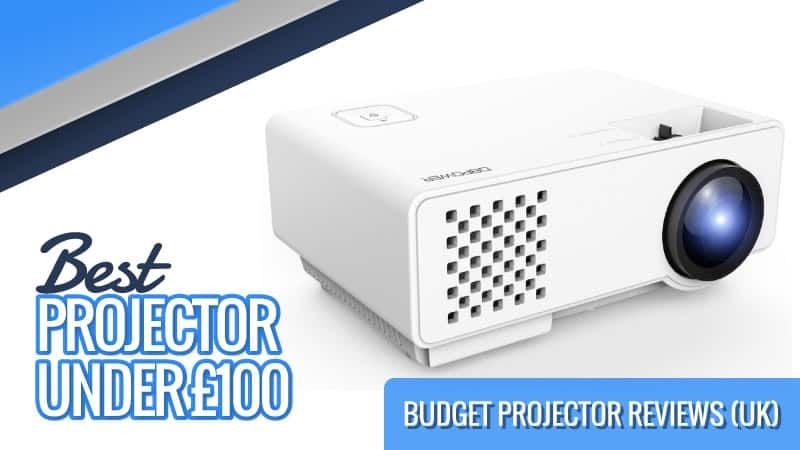 In order to help you find the best projector under £100, we have put this guide together, compiling all of the relevant projector reviews in one place, so you can find something that is perfect for you. There are three main types of projector on the market. While there are some similarities between them, there are also a good number of differences. In this section, we take you through each to give you a better understanding of each. DLP projectors first appeared in the 1980s, and the way they work is by relying on what is known as a DLP chip (known as a DMD) that is made up of around two million tiny mirrors. Each of the mirrors is able to adjust itself independently, moving away from or towards the light to create pixels that are either light or dark. Colour is then fed to the DMD via a beam of light that passes through a spinning wheel of colour. After this, the image is passed through the lens and shown on the projection screen. LCD These projectors have also been around since the 80s, and they use the same liquid crystal displays that you find in watches and other such devices. The majority of LCD projectors use 3 LCD technology, which is a patented system that works to combine three liquid crystal displays. A light source provides a white bean of light, which is then passed to three mirrors, known as dichroic mirrors. These have been shaped to only reflect certain wavelengths, such as red, green, and blue. Each bean of coloured light is then fed to an LCD panel, which receives an electrical signal telling it how to arrange the pixels in the display. Thus, the image is presented on the screen. LED projectors are all about the lighting as opposed to the technology used. In fact, you may find that some DLP projectors are actually using LED lighting. The Pico projector also uses LED lighting in most of its models, and these are often handheld devices that can be transported easily and efficiently. They are found more frequently than you might think. Projectors do have some great uses, and there are thousands of them. In this section, we have gathered some of our favourite projector uses that will keep you entertained, but may also prove pretty useful. You can use them to watch movies. One of the most common uses for a projector is movie night, and one of the reasons for this is that you can use it to create an indoor or outdoor theatre to watch your favourite flicks. Grab the popcorn, get cosy, and stick on a classic for you (and your family) to watch. You won’t go back to normal TV viewing once you’ve experienced the magic of projector movies. They are great for puppet shows with shadow puppets. Everyone loves shadow puppets, kids and adults alike, and the projector is a great way to show off your best shadow creations. Whether you are entertaining the kids, or just mucking around with some friends, it’s a great way to spend a relaxing evening. A projector could help you fall asleep if you project something calming, like the ocean, onto your bedroom ceiling. After all, it’s no secret that the movement of the ocean is incredibly calming for many of us. If you are having a little trouble falling asleep, give this a try with your projector and see if it helps. Of course, you don’t need to use the ocean – pick anything that relaxes you. Dungeons and Dragons will never be the same when you throw a projector into the mix. As a fan of this table-top role playing game, it was one that needed to be included. Next time you have your group over to play, why not whip out the projector? You can make the map take up the entire table, load up character art and sheets, and so much more. The possibilities are endless. Now that you have a little more information on the types of projector and their uses, take a look at the projector reviews below. 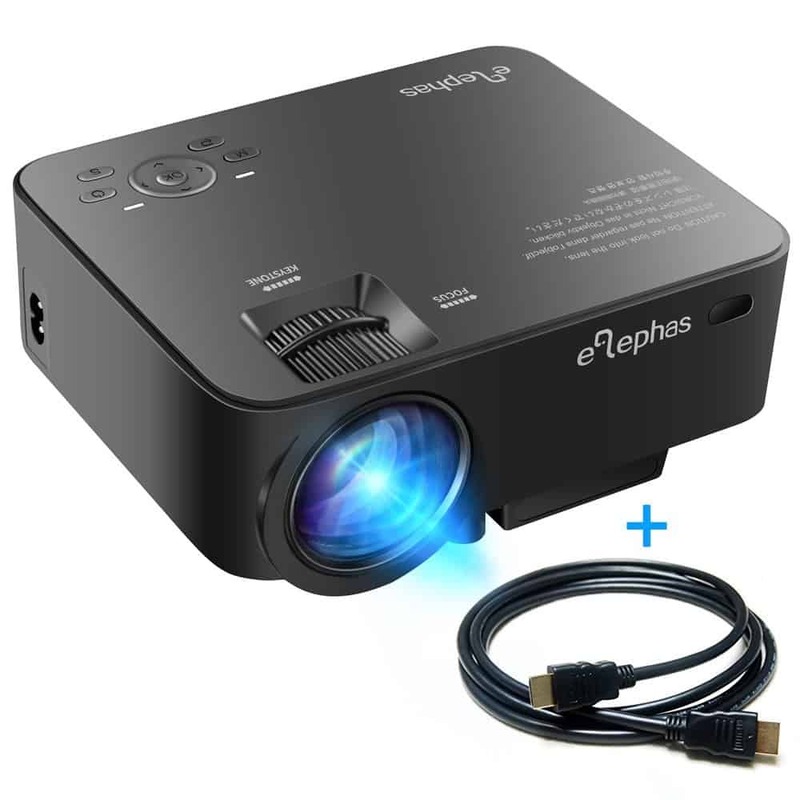 A leading brand when it comes to projectors, Elephas models are some of the best you can get. So, if you are searching for a mini LED projector, then take a look below and see if this is the perfect choice for you. 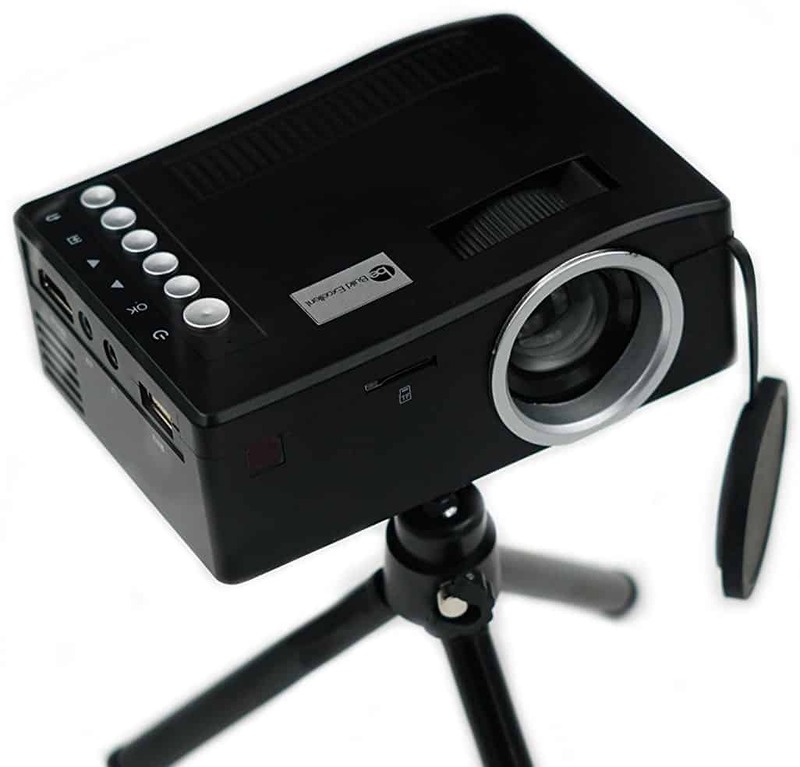 This model of mini LED projector uses the latest technology to provide you with the best projection experience. It is 50% brighter than the standard 1000 lumens model, and also offers a massive range of colours alongside vivid detail on the screen. The projection size can go up to 130”, making it ideal for movie nights or watching the big game. It has a portable and compact design, so it can be taken anywhere – ideal for holidays or visiting friends and family. It has HDMI support, and even comes with a cable, as well as USB, VGA, AV, SD, and TV – so you don’t need to worry about where your media is being stored. It even comes with a one-year warranty, leaving you completely covered. There have been a couple of issues with the focus, and it only really stands out in complete darkness according to others. This reasonably priced projector does have one of the heftier price tags in this guide, but it is well worth the extra expense. With great media support, it makes things much easier and free from hassle, so you can enjoy your movie night in peace. While there have been a couple of niggles with the focus and such, these are few and far between, and are more than made up for by the overall quality of the picture and the model itself. 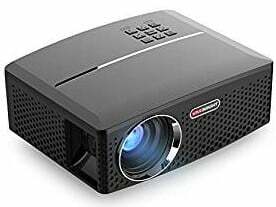 Q: Is it possible to put digital photos on USB stick and view them with this projector? A: Yes it is. It accepts usb sticks amd hdmi cables. If you are looking for a really budget model, then this could be ideal for you. Have a look at the reviews for this mini LED projector below and see if it’s just right for you and your home. This nifty little projector is compact and lightweight. Weighing in at a mere 230g, it can be slipped into a bag and carried around with you to any location, making it perfect for movies at a friend’s house or other gatherings. It can work with a power supply or batteries, making its working location a more versatile one, and the LED lifetime is 20,000 hours. It can work with multiple ports, giving you a more diverse selection to choose from. So, whether you have USB, TV, SD, HDMI, or AV connections, you are sorted with one of these. You can connect virtually anything, which is ideal for showing off holiday pictures from your digital camera, or just settling down to watch a film. Some feel that the picture quality could be a little better. This budget mini LED projector is one of the lowest price models that you are likely to find on the market. It is incredibly lightweight and portable, and while there have been a couple of issues with the overall quality of the picture, this is uncommon. It has a great range of features, and a lot of versatility when it comes to the kinds of devices that it can be paired with. An overall excellent choice. DLP projectors can be a great piece of tech to have in the home, and while they are usually pretty pricey, we have found one that might just make a perfect fit for both you and your budget. Take a look and see for yourself. 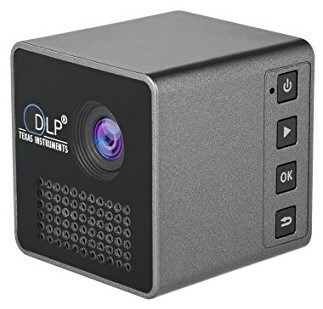 This DLP projector has a sturdy and square design that makes it both modern and recognisable in terms of appearance, so it will likely fit in just fine with your current household tech. It’s pretty lightweight, and can be taken from place to place relatively easily, which is good when you need to take it to a friend or family member’s house for a night of movies and entertainment. The LED lamps have an excellent lifespan of 30,000 hours, so you won’t be running out of juice anytime soon. The batteries are rechargeable, with a good life once they are taken off. Plus, it has its own speakers built into the device, and it can work compatibly with a micro SD card, so you can load up all of your favourite films, TV series, and photos to look through and watch whenever you want. If you are going to watch a feature film, leave it plugged in throughout so that the battery does not die. This affordable model of DLP projector could be the next purchase on your list. While there have been some niggles with regards to the battery life, if you leave it plugged in for long watching sessions, then you will be just fine. Other than that, it has some brilliant features, and easily hooks up to a micro SD card so that you can watch everything you love. It’s a great purchase at a good price. This projector is portable and lightweight, making it easy for you to carry around with you. It features USB plug and play, so minimal setup is required for you to get this model started. It can connect to laptops, TV’s, and games consoles, so you don’t need to worry about where your media is being stored. It can provide you with a 100in screen, which is pretty impressive considering its small design. With an LED lamp that lasts up to 30,000 hours, this could be right for you. 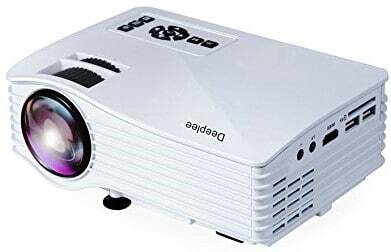 This budget projector with a very portable design is perfect for home entertainment, especially if you are looking for a movie night. You can connect it up to just about any kind of media – including laptops and games consoles – giving you more flexibility with your media choices. It has a built-in speaker and also provides you with a fantastically clear image that you are sure to be impressed by. Plus, it can be used inside and outside, so you can pick any location that suits you. Hopefully, this guide has helped you to find the best projector under £100, ready for your next movie night or for general entertainment. Regardless of the type of projector you are looking for, we have at least one of everything listed here – providing you with a wide range of choices that will leave you feeling impressed. Plus, there is something that fits into every budget in this guide, so you don’t have to worry about a low budget affecting the quality of your purchase. We hope that one of the items here was perfect for you. What did you think of our projector guide? Are there any that you would have liked to see or recommended? We love hearing from you, so make sure to leave us a message in the comments below.